Rev. ed. 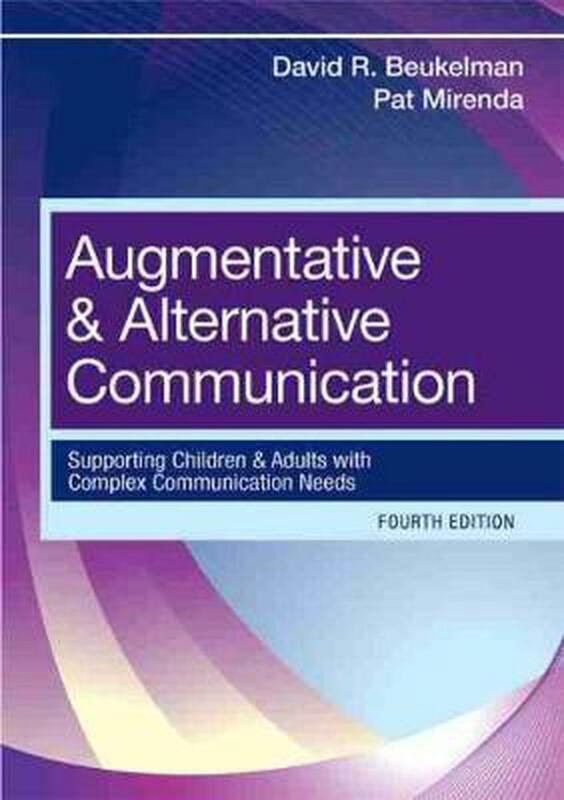 of: Augmentative & alternative communication / by David R. Beukelman, Pat Mirenda. 3rd ed. c2005. As AAC use continues to flourish and new technology revolutionises the field, tomorrow's service providers need current, authoritative information on AAC for children and adults with communication disorders. That's why David Beukelman and Pat Mirenda have revised and updated the bestselling Augmentative and Alternative Communication-the trusted, widely adopted graduate-level text on communication disorders and AAC. An essential core text for tomorrow's professionals-and a key reference for inservice practitioners-this new fourth edition expertly prepares readers to support the communicative competence of children and adults with a wide range of complex needs. David R. Beukelman, Ph.D is the Barkley Professor of Communication Disorders at the University of Nebraska-Lincoln, Director of Research and Education of the Communication Disorders Division, Munroe/Meyer Institute of Genetics and Rehabilitation at the University of Nebraska Medical Center, A research partner in the Rehabilitation Engineering and Research Center in Augmentative and Alternative Communication, and a senior researcher in the Institute for Rehabilitation Science and Engineering at the Madonna Rehabilitation Hospital. With Pat Mirenda, he co-authored the textbook, Augmentative and Alternative Communication: Management of Severe Communication Disorders in Children and Adults. He served as editor of the Augmentative and Alternative Communication Journal for four years. Dr. Mirenda earned her doctorate in behavioral disabilities from the University of Wisconsin-Madison. For 8 years, she was a faculty member in the Department of Special Education and Communication Disorders, University of Nebraska-Lincoln. From 1992 to 1996, she provided a variety of training, research, and support services to individuals with severe disabilities through CBI Consultants, Ltd., in Vancouver, British Columbia. She is now Professor in the Department of Educational and Counseling Psychology and Special Education at the University of British Columbia. From 1998 to 2001, she was editor of the journal Augmentative and Alternative Communication. In 2004, she was named a Fellow of the American Speech-Language-Hearing Association and was awarded the Killam Teaching Prize at the University of British Columbia. In 2008, she was named a Fellow of the International Society for Augmentative and Alternative Communication. Dr. Mirenda is the author of numerous book chapters and research publications; she lectures widely and teaches courses on augmentative and alternative communication, inclusive education, developmental disabilities, autism, and positive behavior support. Her current research focuses on describing the developmental trajectories of young children with autism and factors that predict the outcomes of early intervention. Laura J. Ball, Ph.D., is an associate professor in the Department of Communication Sciences and Disorders at East Carolina University. Dr. Ball completed her doctoral degree at the University of Nebraska with research interests in AAC and motor speech disorders. Dr. Ball has more than 25 years' clinical experience and is the author of numerous publications on topics related to AAC, dysarthria, and apraxia. Janice Light, Ph.D., is a Professor in the Department of Communication Disorders at the Pennsylvania State University. She is actively involved in research, personnel preparation, and service delivery in the area of augmentative and alternative communication (AAC). Her primary interest has been furthering understanding of the development of communicative competence and self-determination by individuals who require AAC. Dr. Light is the principal investigator on several federally-funded research grants to improve outcomes for individuals who have significant communication disabilities through the use of augmentative and alternative communication. She is one of the project directors in the Augmentative and Alternative Communication Rehabilitation Engineering Research Center (AAC-RERC), a virtual research consortium funded by the National Institute for Disability and Rehabilitation Research. In 1996, Dr. Light was recognized as the Don Johnston Distinguished Lecturer by the International Society of Augmentative and Alternative Communication for her leadership in the AAC field. In 1999, she received the Dorothy Jones Barnes Outstanding Teaching Award at the Pennsylvania State University. David B. McNaughton, Ph.D., is a professor of education at The Pennsylvania State University. He teaches coursework in augmentative communication and assistive technology and collaboration skills for working with parents and educational team members. Dr. McNaughton's research interests include literacy instruction for individuals who use AAC and supports to employment for individuals with severe disabilities. He is a partner in the Rehabilitation Engineering and Research Center in Communication Enhancement (AAC-RERC), funded by the National Institute on Disability and Rehabilitation Research (NIDRR). "A tour-de-force . . . should be on the shelf of everyone with a stake in advancing the field of AAC. This book has my strongest possible endorsement." --Joe Reichle, Ph.D.